First of all, please don’t call it a reunion. “We’re always careful to say the Siler Family Meeting,” says Bob McCollum, correcting me gently. We’re standing toward the end of a buffet line of at least a couple hundred people that traces the entire perimeter of the auditorium at Macon Middle School in Franklin. I’m hungrily eyeing trestle tables laid end-to-end with ham and deviled eggs, fried chicken, potato salad, and watermelon, while McCollum shares a bit of the family’s story. Those gathered are descendants of the nine children of Weimar and Margaret Siler, who were some of the first Europeans to settle in Macon County back when it was still Cherokee territory. In many ways, it’s the story of America: Industrious German boy meets spitfire Irish girl, and they set out for the frontier to seek their fortune and live an upstanding Christian life. The twist is that, unlike many families, this one has kept in touch ever since. As far as anyone can tell, it’s the longest-running family get-together in America. “You see, this is the 160th Siler Family Meeting, but it’s actually only been happening for 159 years,” explains McCollum. It turns out the family met twice one year during the Civil War. With some relatives on the Union side and some on the Confederate, they hosted two events to ensure the division didn’t cause a permanent rift in the family. And so it continues to this day, now held at the middle school to accommodate the large crowd. Each year, the meeting is sponsored by the lineage of a different child. (This time it’s Weimar and Margaret’s son, Jacob.) The hundreds of Siler descendants who come continue to bring healthy appetites, but fortunately for the hosts, they also bring potluck dishes. Any number of people ask me if I’m getting enough to eat, which I most certainly am—quite a bit more than enough, frankly. It’s all hard to resist, especially the dessert table. And there amongst the pies and cakes is a framed photograph of a white-haired lady cuddling a baby. It’s Lois Jones, her grandson, Richard, tells me; she was a mainstay of the gathering until her passing five years ago and famous for her pecan pies. That baby in the picture, now 19 years old, is her great-granddaughter, Lindsay, who has since taken over the pie-making mantle. Lois’s visage beams out over the gathering as the sweets disappear, leaving only a pile of crumbs. As that seemingly inexhaustible buffet dwindles, chairs are pushed back from the tables. The crowd sips sweet tea while this year’s officers take the stage. Everyone rises to sing “Blest Be the Tie That Binds,” and then it’s business time. They’ll listen to speeches, give out awards, announce births, deaths, and marriages, review the minutes, report on the balance of the family coffers, and appoint next year’s organizing committee. In the lobby hung with old family photos and memorabilia, latecomers are still filling out sign-in sheets at the welcome desk. They greet each other with hugs, but also quick scans of name tags since many folks aren’t closely acquainted. Harriette Kinnebrew Norman arrives on the arm of her daughter, Johanna. She’s silent and looks around vaguely—it’s clear her memory isn’t what it used to be. “She used to bring us down all the way from Connecticut every year when we were kids,” Johanna says. These days, Harriette lives in Alabama, but nobody seems to question the necessity of making the long drive to the meeting. She’s attended 75 times. William W. Siler, a small, dapper man in thick glasses and twin hearing aids, sits front and center. Most years, he says modestly, he receives two awards: one for being the oldest attendee (now 95), and the other for traveling the farthest, having made the three-day train ride from Morro Bay, California. While the grown-ups talk, the restless children escape to the nearby gymnasium, where they bounce balls and fling beanbags. The teenagers lounge against a wall, passing cell phones back and forth. 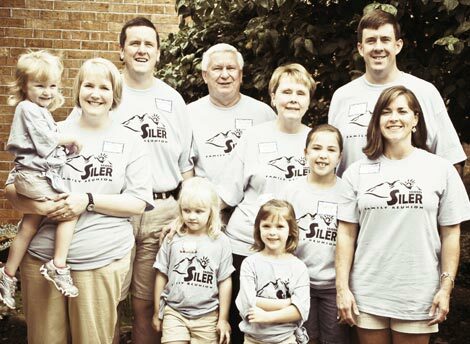 Tonight, they’ll camp at the family cabin on Silers Bald, a tradition recounted fondly by several generations. That’s when they really bond, when they get to know each other personally and form the ties beyond those of habit and obligation that keep them coming back. As the speeches continue, a few folks begin to sneak out to get on with their days. This year, William is beaten out for both prizes by dark horse contestants—a woman from Oregon and another who turns out to be 99 years old, surprising everyone and prompting a standing ovation. When it comes time for the final prize, for youngest attendee, it’s a shoo-in: little Alex McCollum, age 10 and a half months, is the only person present under a year old. His dad steps to the front of the auditorium, beaming as he calls out the details of Alex’s birth to be recorded in the minutes. The baby is hot and rubbing his eyes, more concerned with taking a nap than the rather weighty title he’s receiving. But he’s in good company. Most everyone here was once in his position: a new baby welcomed to the family, entrusted to carry the venerable Siler line into the future. They conclude with a chorus of “God Be With You Till We Meet Again,” and part with hugs. With full bellies and full hearts, they disperse into the hot afternoon just like so many generations have before. For more information about the family, visit www.silerdescendants.org.